A complete set of 10 foobar PCBs, with top and bottom plates is $36.08 shipped to US/Canada via DHL. Other countries may be more or less. That's enough PCBs to make 5 complete split keyboards, or 10 macropads. Ordering is not much different than ordering from EasyEDA.com. It is a little easier since it fills in the board dimensions for you after reading the gerber files. Download the gerber files from github. Go to JLCPCB.com and create an account. If you already have an EasyEDA account you can use that. Go to the shopping cart and click "Add new item". Click on "Add Gerber File" and select the foobar zip file. Since the PCB is smaller than 100mm x 100mm they have a discounted rate for up to 10 pieces. Pick 5 or 10 pieces and select your soldermask color. Changing other options will increase the cost. Why would you only order 5 instead of 10? To save weight, and reduce shipping costs. But for such a small order it probably won't make a difference. Repeat 3-6 for each additional PCB you want to order. The first 100mm x 100mm PCB is $2 and additional ones are $5. 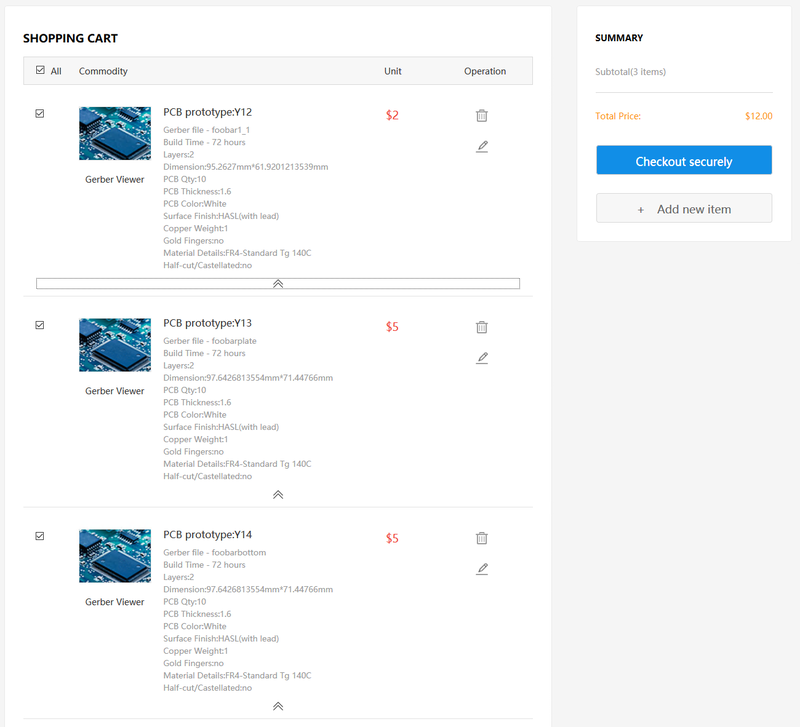 In the cart you can view the details of each item by expanding it. 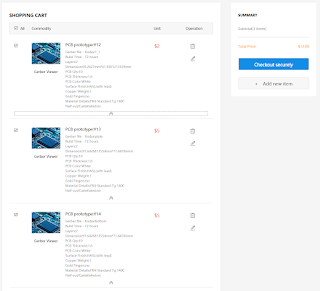 Once you have all your PCBs in the Cart click the "Checkout Securely" button. 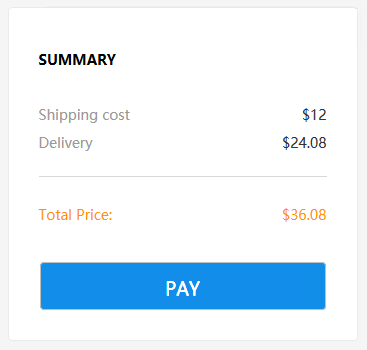 On the checkout page you fill in your address, the country determines the shipping rate. The shipping options are below the address. DHL takes about 2 days to deliver (not including the 3-4 day manufacturing time) Airmail can take up to a month. I've only placed one order with JLCPCB so far, it is still in the production stage. Other than the ordering process I don't expect any surprises on what is delivered since it is the same company as EasyEDA. Ironically, due to the large discount on this size of PCB, if you wanted more than 10 pieces you would need to order over a 1000 pieces to get anywhere near the same unit price. This video goes through the process of ordering a set of foobar PCBs with plates. Ordering foobar PCBs from JLCPCB.com from di0ib on Vimeo.